To serve the local community by providing transportation (for those in need of a ride), to Sunday Morning, Wednesday and any other services at Oak Grove. We are committed to operating with excellence, serving with a GOD centered attitude, and being an example through our words and actions. 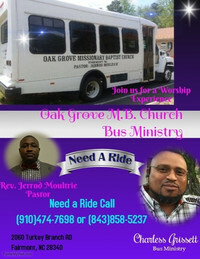 OAK GROVE VAN MINISTRY PROVIDES TRANSPORTATION FOR OUR SERVICE. Reservations must be made by Thursday every week by calling (910) 474-7698. Your name will then be placed on the Van Ministry list. You will receive a call on Saturday and again on Sunday confirming your reservation. You must be available for this call. - All passengers must fill out a liability release form. - A parent or guardian must accompany children and youth under 18 years old. - No additional stops will be made; unscheduled and recreational stops such as McDonalds are prohibited. - Passengers must be ready when the van arrives or the van will depart without them. NOTE: Passengers will have a 5 minute grace period once they are informed. ***NOTE: Every effort will be made to allow van passengers in need of ministry to receive prayer and ministry immediately after the service prior to departure. However, extended periods of time will delay drop off times, and potentially inconvenience other passengers. - All passengers riding the van will be contacted by phone either Friday night or Saturday morning to re-confirm that you will be riding the van. - Passengers must be ready for pick-up by 9:30 am on Sunday. - If passenger needs to cancel, it is very important that you call as soon as possible, no later than 3 pm on Saturday. - The driver will call passengers again by the driver on Sunday morning to re-confirm if a ride is still needed. - Passengers must be available to answer the phone. If the driver cannot reach the passenger by phone, the passenger will not be picked up. - If the passenger has an infant, two seats are needed. Children cannot sit on a parent’s lap and must be placed in child restraint seat. Any issues or concerns should be directed to Willie Earl Grissett, Chairman of Trustee and/or Charles Grissett, Van Ministry Lead.